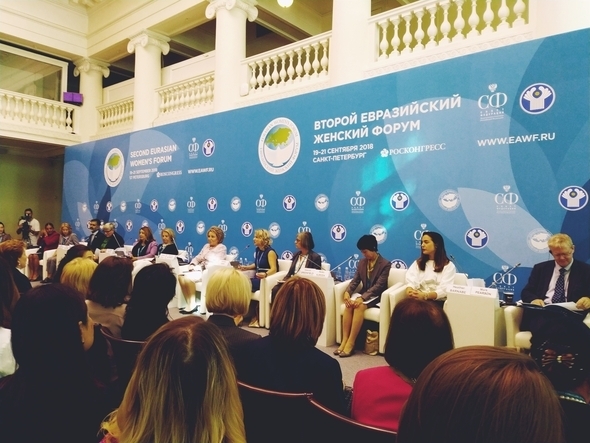 The W20 meeting for the first time was held in Russia in the framework of the Second Eurasian Women Forum in St. Petersburg on 20 September 2018. The event was organized in the partnership with the Ministry of Foreign Affairs of the Russian Federation and the Russian Union of Industrialists and Entrepreneurs (RSPP). The meeting was attended by representatives of the G20 member countries, non-member states, international organizations, including the International Labour Organization (ILO), Organisation for Economic Co-operation and Development (OECD) and United Nations, associations of women entrepreneurs of many countries, in particular Germany, Turkey and the UK, as well as the G20 formats of engagement with social partners - G(irls)20, Business20, Civil20 and Think20. The meeting brought together women from business, civil sectors, politics and academia. The participants addressed a wide range of issues, including international cooperation in the interests of women, economies and societies; W20 main achievements and future priorities; as well as W20`s contribution to the G20 agenda on women economic empowerment. Ms. Svetlana Lukash, Russian G20 Sherpa, Deputy Head of the Presidential Experts’ Directorate of the Presidential Executive Office moderated the meeting. H.E. Ms. Valentina Matvienko, Chairperson of the Council of the Federation of the Federal Assembly of the Russian Federation welcomed the participants. The programme included presentations by Dr. Gülden Türktan, W20 Founding President; Ms. Susana Balbo, Chair of the W20 under the Argentinian presidency; Ms. Karin Van Mourik, Board Member of the Association of German Women Entrepreneurs; Dr. Reiko Kuroda, Professor of the Research Institute for Science & Technology at the Tokyo University of Science and Professor Emeritus at the University of Tokyo. Ms. Gabriela Cuevas Barron, President of the Inter-Parliamentary Union shared with the participants insights on the inter-parliamentary dialogue in the interests of women. Ms. Deborah Greenfield, Deputy Director-General for Policy of the International Labour Organization (ILO) reflected on the IOs` priorities in creating equal opportunities for employment of women and men. Women 20 (W20) is an official G20 engagement group established in May 2015. The W20 creation was blessed by the G20 leaders in their Antalya Communiqué which highlights the leaders` commitment to promote women’s economic empowerment as an integral part of G20 agenda for strong, sustainable, inclusive and balanced growth. W20 – G20 dialogue focuses on such issues as full property rights for women and girls; equal labour opportunities and pay for equal and equivalent work; quality education for girls and women; full access on equal terms to productive and financial resources; equitable representation of women in decision-making positions.